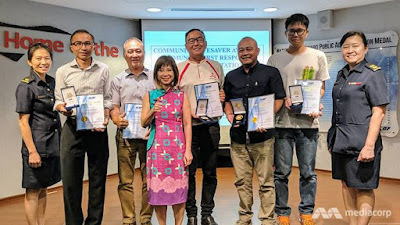 Six residents were commended on Friday (Feb 23) for saving a man who suffered a cardiac arrest at Hong Kah North Community Club last November. The incident happened at around 9.45pm on Nov 21, 2017. Mr Denny Ng Kheng Yong, 42, and Mr Raymond Chew Ho Kiat, 52, were having a chat at the club's general office when they were informed that a man had fainted on the fourth floor of the building after playing table tennis. The pair was later joined by Mr Asnadi Robani, 50, Mr Billy Lim Kuang Lee, 32, and Mr Tee Hee Lon, 26. Another man, 67-year-old Wong Kuek Phong, rushed to take an automated external defibrillator (AED) from the first floor when the victim showed no signs of recovery. It took three shots of the AED before the victim was resuscitated.